UK Space Agency brings satellite tools to Government departments. Applications of space. Credit: Satellite Applications Catapult. Satellite data could soon be playing a bigger role in vital Government services with the start of the first 14 projects funded under the UK Space Agency’s Space for Smarter Government programme (SSGP). From flood management to air quality monitoring, and breast cancer screening to shale gas impact monitoring, the projects will explore new ways for central and local Government to embed space services such as Earth observation (EO) and satellite navigation in everyday operational activities, enabling them to save money, increase innovation and deliver more efficient public services. The UK is a world leader in space services and technologies with the Government and the space industry aiming to grow the sector to a £40 billion turnover per year by 2030. The use of space by the Government is a vital part of this growth strategy and will enable SMEs and other space sector organisations to further develop viable satellite enabled services for export or commercial use. The UK space sector is an engine of growth for the UK, growing at over 7% per year with over 5,000 jobs created in the last two years. Space is increasingly playing a vital role in our everyday lives and through this new programme the Government will harness the potential of space and integrate it into its day to day business to help save money, innovate and make more effective decisions. The uniqueness of this programme is that all of its projects have the public sector customer fully engaged. For example, the Department of Environment has formed an oversight group to rapidly assess the outcomes of the SSGP projects that could assist in its goal to increase its use of EO in accessing impactful evidence to develop and implement policies in more cost-effective ways. The Space for Smarter Government Programme is a strategic, national, programme established and led by the UK Space Agency in 2014, and delivered in collaboration with the Satellite Applications Catapult, to enable the public sector to save money, innovate and make more effective policy decisions by using space products, data and services for routine business. provision of neutral and critical support for the public sector, understanding its requirements and supporting the development of sector owned strategic road maps/action plans. This project will test the feasibility of providing near real-time, high resolution, wall to wall soil moisture alerts for the UK to use in flood warnings. Coastal Sentry and RoofWatch will prototype and demonstrate benefits of satellites in the detection of damage caused by severe weather events, including erosion and damage to buildings. Coastal Sentry will focus on pre-identified areas of risk and will task orbital satellites to examine these areas after severe weather events to look for erosion, landslides or significant cracking and report this to the appropriate department. RoofWatch will focus on monitoring damage to roofs and building motion after severe weather events at the behest of insurance companies or local authorities. The aim of Sea Level Spacewatch is to provide regularly updated sea level advice around the UK, using data from space-borne altimeters and tide gauges. This project is the feasibility study developed specifically for the agencies with the responsibility for advising the Government on flood defence planning and climate monitoring. This project is a feasibility study as a precursor to a national service that could supply satellite air quality data to local authorities, giving them a more detailed picture of air pollution sources and impacts. This project aims to demonstrate to local Government the potential of a portfolio of EO-based flood information products. It will investigate, through example-led consultation, the interest amongst Hampshire Hub partners in EO-derived products such as rapid response flood maps, with the potential to enhance flood risk management in the county. The aim of this project is to identify the viability of location-based technology that will allow citizens to quickly report safety and compliance issues within urban areas, allowing local authorities to supply faster, more efficient maintenance services. The tree management project, being trialled with Exeter City Council, is being run in two stages, the first stage using a small number of mobile devices and the second stage being the creation of self service on the Council website for public use. The aim of this project is to research and design a breast screening vehicle that will exploit all of the benefits brought by satellite connectivity such as decreased cost with increased capacity and elimination of data entry errors. If built and adopted, the screening vehicle would allow NHS trusts to save money through reduced costs of screening and would provide more effective coverage and greater reach, resulting in more women being screened, more cancers detected earlier and better clinical outcomes. This project will explore the effectiveness of the Interferometric Synthetic Aperture Radar (InSAR) to provide data that could serve to aid the Department of Energy and Climate Change in the regulation of shale gas exploitation. InSAR will monitor any land change that occurs during shale gas extraction. The Hub and Spoke Data/Mapping Service will explore options to create sustainable, operational services from satellite data and products to enable smarter, more efficient operations, reduce risk and enhance policy making. The project will benefit Defra and all its agencies and networks by providing a lower cost and sustainable evidence based system to inform and manage its agricultural and environmental remits. The EU Common Agricultural Policy reforms are introducing a new subsidy scheme in 2015. To meet the needs of the scheme it is expected that more geographic information will need to be captured, maintained and validated on an on-going basis by the Rural Payments Agency. This project will examine the usefulness of EO data for the new regulations that will soon be introduced and provide a sustainable and lower cost method of meeting EU requirements. The aim of this project is to look at the practicalities for using SAR data in an operational monitoring programme to track environmental impacts of land management. It would help Natural England to protect the natural environment and ensure that contributions to GHG emissions are controlled. The reality of using satellite data operationally will be shared more widely by the SSGP programme. 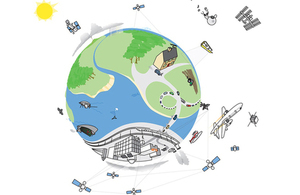 In partnership with Defra, the Environment Agency and the wider Defra Network, this project will explore how a ‘centre of expertise’ within the Defra Network might provide opportunities to promote satellite use in a more integrated and cost-effective approach. The focus of the study will be on satellite EO technology but will also take into account other platforms including airborne, unmanned autonomous vehicles (UAVs) and high altitude balloons (HABs). The final report will demonstrate how current work practices may be successfully translated into a centre of excellence model that could benefit UK through better, lower cost administration. Catchment Sensitive Farming (CSF) delivers practical solutions and targeted support to enable farmers and land managers to take voluntary action to reduce water pollution from agriculture and protect water bodies and the environment. The project will examine how space applications can be applied by the CSF user community and will make recommendations on overcoming any barriers to the uptake of relevant EO datasets. Core Customer: Defra and JNCC. This project will enhance the business case for the operational use of EO data in the monitoring and managing of biodiversity. It has been demonstrated through the ‘Making Earth Observation Work’ project that EO techniques together with the development of geoinformatics have the potential to make a significant contribution towards quantifying habitat extent, composition and condition as part of a suite of surveillance techniques. This will look at the costs and benefits of such a system. The first round of projects look to benefit services such as flood management, weather damage management, air pollution monitoring, city maintenance, medical screening, mapping, land management and biodiversity management. A full list of projects can be found in the notes for editors.